Enterprise supports both Windows Active Directory and OpenLDAP. See the comments at the end of this article for information about configuring multiple LDAP servers. Step 2. Below the list of groups, click Import User Group. 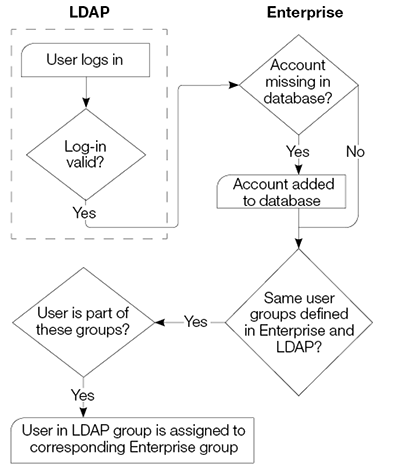 A page showing all created LDAP user groups appears. Step 3. Select the user groups to import. Step 4. Click Import Selection. Step 5. Select the network domain from where you want to import from. Step 6. (Optional) Apply a query such as “*Admin*” to narrow down the results. Step 7. Tag the groups you want to import. Step 9. Add the imported groups to the User Authorizations section of the Brand that the users should have access to. Step 9a. On the Brand Maintenance page, click Add in the User Authorizations section. Step 9b. From the User Groups list, choose the user group that needs to be added. Step 9c. Click Add Authorization. Step 9d. Make a choice from each list. Step 9f. (Optional, only necessary when not having chosen '<All>' for both the Category and Workflow Status lists) Continue adding Authorizations for as many Category/Workflow Status combinations as necessary. Check the column named 'Assigned to User Groups' on the Overview of Users page. 8 October 2018: Corrected some of the steps in section 'Importing user groups'.